Small but insidious. The men who are arrested and charged with domestic violence rarely make it into the headlines. 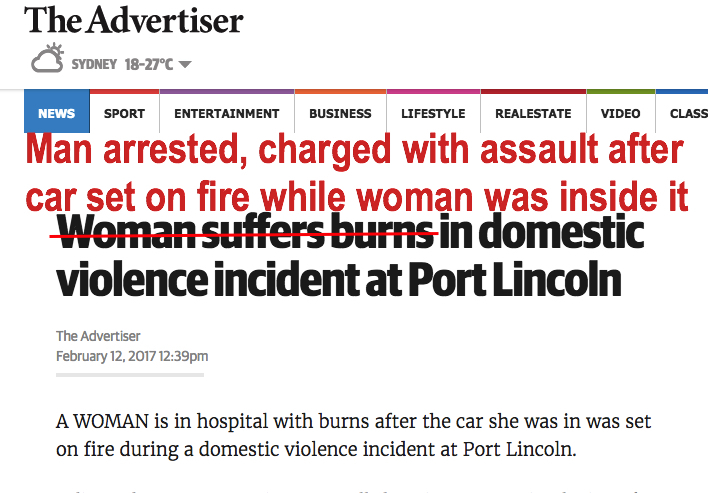 This woman didn’t just “suffer burns”, the car she was sitting in was set fire to. A man has been arrested and charged with “acts to endanger life, aggravated assault cause harm and property damage by arson”. It’s up to the courts to decide if he is guilty, but it is not up to the media to erase him from the story.